What was once only for the Jewish holiday of Purim is found daily at Three Brothers Bakery. "I think people like our Hamentaschen because they are great with coffee or milk, easy to eat in the car, not too sweet and we offer a variety of fillings-there is something for everyone," said Bobby Jucker, 5th generation baker and co-owner of Three Brothers Bakery. As Three Brothers Bakery prepares thousands of Hamentaschen for the Jewish holiday of Purim, co-owner and 5th generation baker, Bobby Jucker has come to realize this Jewish baked good is becoming mainstreamed and desired by even the non-Jewish community. Hamentaschen are typically made for the upcoming Jewish holiday of Purim which begins the night of March 20th this year. During this holiday the story of Esther saving the Jewish people is told. The bad character in the story, Haman, wants to kill all the Jewish people. When the story, the Megillah, is told and Haman’s name is called out there is every effort made to drown out his name with noise makers, called gregors, and stamping of one’s feet where everyone writes the name Haman on the soles of their shoes. In the end Queen Esther saves the Jewish people and every year there is a celebration in commemoration of this happy day. But for some reason Haman was immortalized with a cookie in his honor – Hamentaschen. 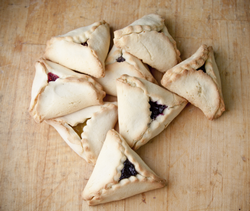 Hamentaschen are triangular shaped cookies and filled with the traditional fillings of poppyseed, apricot or prune. It has been said the cookies are triangular in shape as was Haman’s hat or pocket. At Three Brothers Bakery revelers also find various fruit fillings – blueberry, raspberry, cherry, strawberry and apple, plus some more creative types of s’mores with chocolate/kosher marshmellow filling and a chocolate dip, chocolate chip dough with chocolate filling and the all-time favorite of simply chocolate. Bobby Jucker recalls about 15 years ago a woman bought three dozen poppyseed Hamentaschen every two weeks, so he used to put out the extra from the batch. When they sold quickly he realized people wanted them all year round, so he started making them every day and has not stopped. “I think people like our Hamentaschen because they are great with coffee or milk, easy to eat in the car, not too sweet and we offer a variety of fillings-there is something for everyone,” said Jucker. “Now I even see them in mainstream stores, although they aren’t as good as mine,” quipped Jucker. His claim was backed up by the Jewish blog – The Nosher. The blog proclaimed Three Brothers Bakery’s Hamentaschen some of the best in the nation. Three Brothers Bakery’s Hamentaschen can be purchased at any of their three stores and online, where they can be picked up in-store, delivered in the Houston area or shipped within the United States. For more information regarding Three Brothers Bakery, Purim, Hamentaschen and other baked goods offerings please contact Janice Jucker at 713-299-2139 or media(at)3brothersbakery(dot)com. The traditions of Three Brothers Bakery began in Chrzanow, Poland circa 1825, and were preserved despite the family’s concentration camp imprisonment during the Holocaust. Their miraculous liberation, and subsequent move to Houston, brought Eastern European scratch baking traditions to 4036 S. Braeswood Blvd, 12393 Kingsride Lane, and 4606 Washington Ave where the owners are now proud to call themselves “memory makers who just happen to be bakers®.” Perfecting the process for almost 200 years, each day the fifth generation bakers produce mostly dairy-free breads and pastries, cookies, a full line of specialty dessert cakes and pies, as well as custom birthday, special occasion, wedding and groom’s cakes using only the highest quality ingredients. The Three Brothers Bakery pecan pie was named “the best mail order pecan pie America has to offer” by Country Living magazine most recently in 2016, bakery owner, Bobby Jucker competed in the popular ‘Food Network Challenge’ and has been seen on Food Network’s Outrageous Food. Three Brothers won “Best Mail-Order Pies 2012” from Bon Appetit, as well as Modern Baking’s “2013 Retail Bakery of the Year” and was part of The Knot’s “2010-2013 Best of Weddings” and “Hall of Fame” picks. In 2013, the bakery won the Jeffrey Butland Family-Owned Business of the Year by the Houston division of the U.S. Small Business Administration. Most recently, Three Brothers Bakery was named one of “America’s 20 Best Bakeries” by The Daily Meal in 2016 and in 2017 blue ribbon champion at the American Pie Council’s National Pie Championship for their key lime pie in that category, and in 2018, the bakery’s Pumpecapple Pie Cake was featured on BuzzFeed’s ‘Worth It’ web series. In 2018, Three Brothers Bakery received the SBA Phoenix Award for Small Business Disaster Recovery and encourages everyone to “shop disaster zones” to help small businesses recover after natural disasters. Three Brothers Bakery Preparation of HamentaschenThree Brothers Bakery fills cutout circles of cookie dough to prepare Hamentaschen daily and ramps up production for the Jewish holiday of Purim. Three Brothers Bakery form Hamentaschen into a triangular filled cookieAfter filling the cookie dough, the dough with filling is brought together in a triangular shape to make Hamentaschen.